Donate a Tweet to End Hunger! September is Hunger Action month and Feeding America has a great digital campaign going on to help raise awareness and encourage donations. In addition to the standard “Like Us” and “Follow Us” call-outs, Feeding America has gone a few steps further to capture a larger audience in an engaging way. Supporters of the initiative have several ways they can get involved ranging from “donating” a tweet or Facebook status to donating money or food to a local food bank. 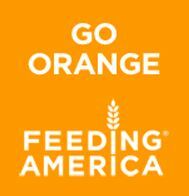 People can also show their support on September 6th by “going orange” (the official color of Feeding America) both in real-life or online via a twibbon on their twitter avatar or by adding the Feeding America icon to their Facebook profile picture. Their Facebook page is fully equipped with a location finder and an interactive map that helps users connect with their local food bank. Another cool feature is a meter that shows their progress towards their goal of 10,000 actions against hunger for the month of September. Feeding America’s multi-channeled approach to fundraising is a new trend among non-profits, who are using social media and the web more and more to supplement their traditional efforts. What do you think of this campaign? Will you be donating a tweet or a few cans of food? Let us know in the comments!